I have a great Valentine’s Treat for the kids today! This recipe came from a super fun book, Tequila Mockingbird (Goodreads review here). Right away, the punny title appealed to the bibliophile in me. Plus I do love a cocktail! 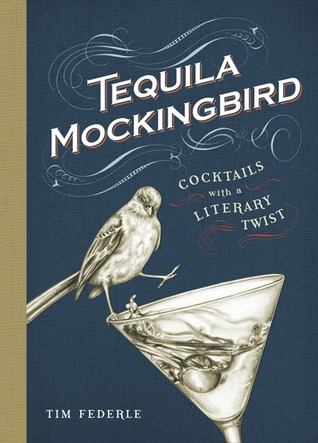 The whole book is hilarious and offers recipes (mostly alcoholic) that all connect in some way with a popular (mostly classic) novels. Though many of the drinks sounded delicious, I reeeaally wanted to make something based off a book I’d already read. So I added a TON more books to my to-read list and chose the Chocolate Fake-tini, based on Charlie and the Chocolate Factory! I read Charlie and the Chocolate Factory out loud to my kids last year and they absolutely loved it. Spud almost cried when Charlie didn’t find the golden ticket the first time and both boys danced around, cheering when he did find the ticket! 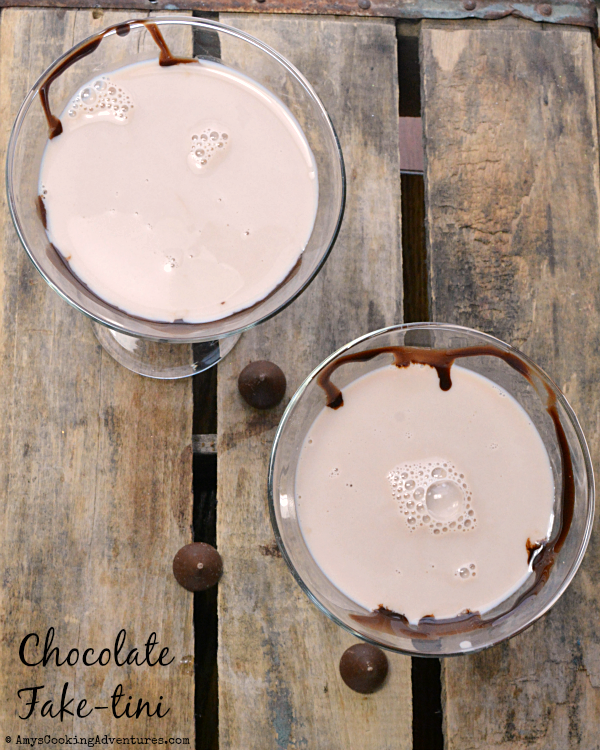 My boys love to drink out of fancy glasses (in fact, for part of their birthday celebrations, they get to drink their milk or juice out of a wine glass all day), so they loved being able to have their chocolate milk out of a martini glass! If you really want to make a decadent treat, you can use cream in the “martini”, but I just used milk. 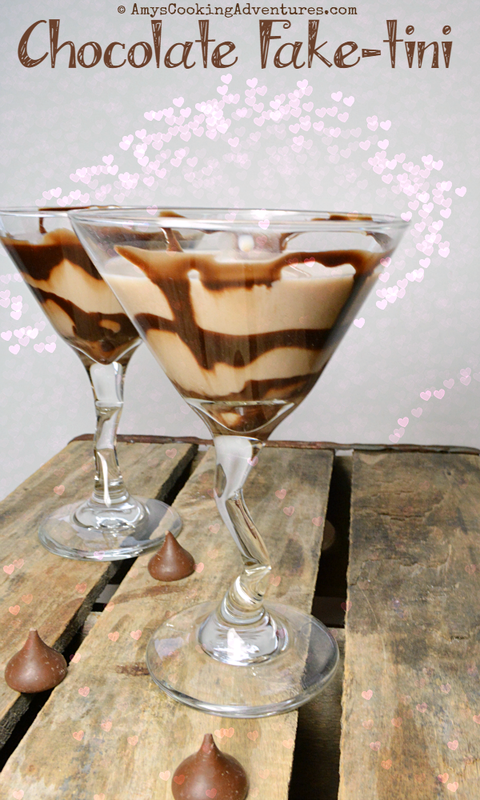 The chocolate syrup and Hershey kiss in the bottom of the glass were special enough for my kids! Enjoy the “martinis”, I’m off to read a bunch more books now. 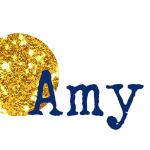 Linking up to January Foodies Read at Based on a True Story. Drizzle half the syrup into two martini glasses. Drop a Kiss into the bottom of each glass. Place the milk and remaining syrup into a shaker full of ice. Shake to combine, then strain evenly into two glasses. That sounds like a great book. I'm a sucker for puns too. This sounds like a fun book. Frank would be in his glory.